Crystal Skulls are like wise computers and are storage of wisdom and knowledge and they come forward at this point to assist us and humanity with healing and remembering our Galactic Origins. 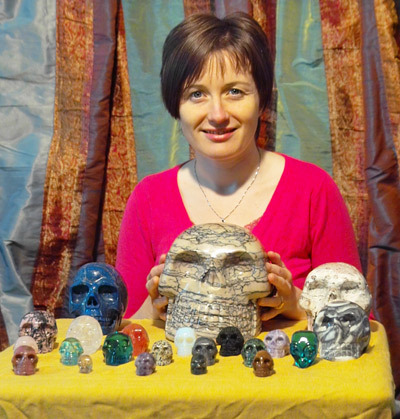 In this workshop Alphedia had an array of Crystal Skulls for you to receive downloads and attunements from. She channelled guided meditations with the Crystal Skull Conclave and she will channelled live for messages from participants own personal Crystal Skulls. You learn how to lay out Crystal Skull Grids and how to work with the Crystal Skulls to do physical healing overlays on yourself and others. The Crystal Skulls wish to bring through new wisdom for humanity and Alphedia worked with her skull Ardmano who is a 27 kilogram Preseli Bluestone Crystal Skull (same crystal as in centre of Stonehenge). He is a Star Gate portal and will bring through powerful healing for each one of you taking part. No experience of working with the Crystal Skulls is necessary nor is being a guardian of a Crystal Skull. We do however have lots of crystals skulls for sale on our webshop. Alphedia has been working with Crystal Skulls since 2009 and been channelling their voice in healing, workshops and retreats since then. “Greetings I am the one that is known as Sherling. I am a Merlinite Skull and I have been over the last six months gathering wisdom and knowledge from those who have entered in my vicinity. As well as travelling to receive wisdom for this workshop. I have accessed wisdom from the Atlantean Crystal Skull in Hawaii and there will be an Atlantean Crystal Skull activation and healing from the Hawaiian Atlantean Skull. In this workshop you will learn a bit about the history of the Crystal Skulls which we channel through and you will have the opportunity to work with many different types of skulls. We are keen to show you commands and activations that you can say to your skull to allow them to create an energy field grid in your holographic matrix. We will also show you how to do skull layouts to maximise healing benefit. Alphedia has also featured in Judy Hall’s new Crystal Skull book writing the chapters on Earth Healing with the Skulls.